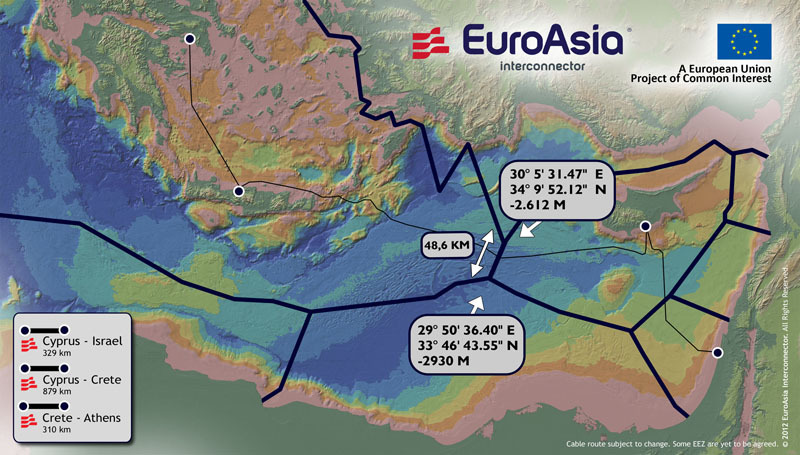 Geneva - The Euro-Mediterranean Human Rights Monitor sent an urgent letter to the European Union's European Commission regarding their participation in funding EuroAsia Interconnector, a power transmission project aiming to build the infrastructure necessary to link energy sources between Israel, Cyprus and Greece. The project, expected to be implemented in June 2019 with an estimated budget of 3.5 billion euros, will not only link the electricity infrastructure between Israeli cities with Greece and Cyprus, but will also include illegal settlements in the occupied Palestinian territories, including East Jerusalem. The European Union has been labeled as one of the financiers and supporters of the project that nurtures and strengthens settlements built illegally on Palestinian lands in the West Bank and Jerusalem, a move that shows sheer disregard for international law and amounts to complicity in Israeli war crimes and crimes against humanity. The EU must adhere to its legal obligations under international law, including by not violating its own long-held commitment to a two-state solution. What we rather see is support for a project benefiting settlers, the product of illegal occupation in accordance with international resolutions,” said Audrey Ferdinand, Euro-Med’s legal researcher. Euro-Med Monitor expressed deep shock and surprise at the contradictory policies and non-neutral practices of the European Union. On the one hand, it funds projects to help Palestinians suffering under occupation, it also funds projects that serve illegal settlers, calling the move as setting for a double-standard logic. Euro-Med Monitor calls on the European Union to seriously reconsider its policies that are biased to the Israeli authorities at the expense of the Palestinian people. The nonprofit group also called on the EU to uphold its human rights obligations and to rise above the discourse of selfish interest. Finally, the Euro-Mediterranean Human Rights Monitor calls on the European Union to stop the project, especially as Israel continues to expand its illegal settlement activities in the West Bank and East Jerusalem, and not reward them for such infamous record of human rights abuse. It is worth noting that Euro-Med Monitor also addressed UNICEF regarding their apparent involvement in the project but it was later revealed that the Children’s food and healthcare provider was falsely and “fraudulently” dubbed as one of the project’s sponsors.